Replikah HF is a superb Zweibrucker mare that represents a beautiful combination of Holsteiner and Thoroughbred breeding. She is a fine example of why one must consider pedigree in determining a mare’s potential for success in the breeding shed. Replikah was bred,( foaled in 1998), and raised by Stephanie Severn of Hopeful Farm in Wisconsin. 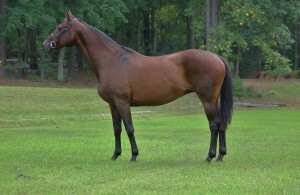 She is the product of the Thoroughbred mare, Action Battle, and the powerhouse, Hosteiner stallion, Regulus. Action Battle was a top quality, well decorated Show Hunter who competed under the name April First. Her Thoroughbred lineage is rooted in the same foundation lines that produced the world-reknown stallion, Ladykiller, as well as other equally notable Thoroughbred stallions such as Teddy, Princequillo, Dark Ronald, Nasrullah, Nearco, Blenheim II, and Bay Ronald. As far as Thoroughbred breeding applies, these are the same bloodlines that are so highly desired today to be incorporated into the development of modern sporthorses. Before her death in 2000, Action Battle produced 6 foals. Twice bred to the Oldenburg stallion, Alpenstern, she produced foals that fulfilled their genetic potential to become top Show Hunters. Then bred to Regulus, specifically for the dressage arena, she produced two fillies. 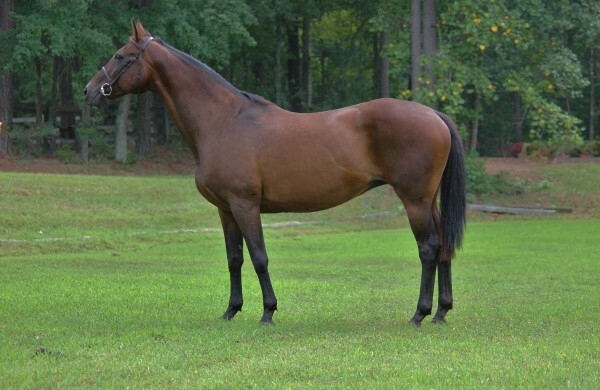 Replikah’s sister, La Championita HF, came first and proved a winner at USDF Breed Shows as a weanling , was the Reserve Champion Mare at the 1999 Oldenburg Mare Championships, and in 2001 was approved Premium and became the Highest Scored Mare in the USA by the Rheinland Pfalz-Saar International. 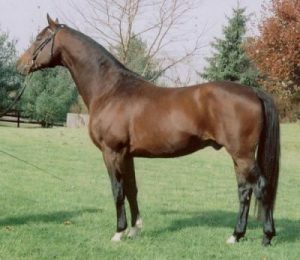 Regulus, Replikah’s sire, was the 1993, 16.2h, Hosteiner stallion bred by Kathy Peterson of Michigan, and owned and stood by DreamTime Farm in Kentucky. 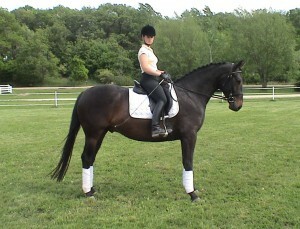 Regulus represents the best of an extremely successful Holsteiner dressage pedigree. He was sired by Rapport, the highly successful Grand Prix Dressage stallion, and his damsire was Franat who also sired Fraval. His Holsteiner lines also boast the famed Thoroughbred influence of Ladykiller on both sides, and he was successful as a sire of jumping horses as well as dressage mounts. In 1999, he was licensed and approved by the RPSI, the AWS, and the PHR. In 2000 he was Grand Champion, Mature Horse Champion, Champion Holsteiner, Champion AWS , and Stallion Champion of the MSCTDA Dressage and Breed show boasting a score of 82.5% ! Most notably he sired three approved sons; USDF 2005 Horse of the Year Raison do Joie, and 2002 USDF Horse of the Year Roi de Soleil D, and Romulus. He also produced Raison d’Etre who was on the 2004 USAE Young Horse Short List for the FEI World Breeding Championships. Regulus was also the winner of 9 out of the 11 Get of Sire classes he entered in USDF Dressage & Sporthorse Breeding Shows. He sired an amazing 8 Site Champions of inspections and 32 of his 34 offspring were inspected and earned First Premium with scores of 8.0 or higher. This modern sporthorse stallion with outstanding canter and athleticism, was well known for stamping his foals with his superb shoulder and front end, as well as his extraordinary engagement and gaits. Replikah herself , though smallish as far as warmbloods go, standing only 15.1h, also represented the ideal modern sporthorse mare. She was presented to the ISR as a foal recieving an 8 on conformation and type. Inspected, approved, and registered by the RPSI as a yearling she could not be graded, but was described as having superb conformation and pedigree, with movement that was light, airy, and always forward. 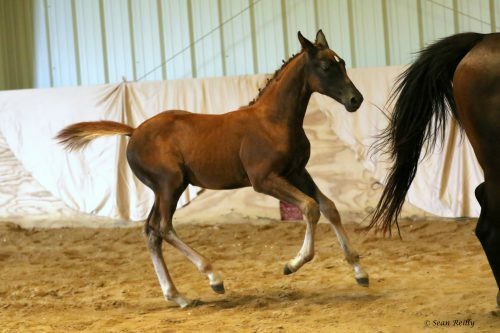 Replikah was Reserve Young Horse at her first Breeding show. 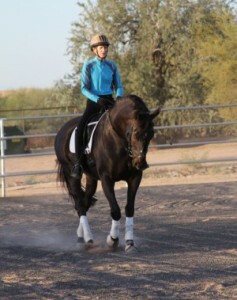 As a superfine young prospect she was taken into the dressage training program and was working First Level, schooling Second when a pasture injury derailed her career. Fortunately for the little mare, her genetic assets proved extremely useful in her next career, as an extremely successful broodmare. She was inspected and approved into the Main Mare book of the RPSI the following season, and consequently bred and produced the first of six (so far) consecutive Gold Premium foals! Her first foal, a colt named French Kiss, by the extremely popular Hessen stallion, Freestyle, was born in 2004. He earned a Gold Premium at his RPSI Inspection with solid 8.0 scores across the board. Verb Pr St Sophia Loren HF …In 2007, Replikah’s first filly was born. 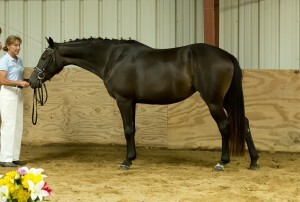 Sophia Loren HF was also sired by Stedinger and also recieved Gold Premium status solid scores of 8.0! In 2016 , Sophia was awarded Gold Premium status and was Site Champion Mare by RPSI Inspection! RPSI Champion TOP Scoring Mare for 2016!!! In the fall of 2010, Replikah was bred to the imported Oldenburg stallion, Dream Along, who provides special dressage genetics linking the Dream of Love/Dream of Heidelberg/Bergamon with the Corleone(Holsteiner) lineages. She produced, Dekadence, another fabulous dark filly with excellent movement and conformation. Because she was born after the inspections for that year, Dekadence was RPSI inspected and approved in 2012 as a yearling. She could not be graded, but was used as an example to the audience as to what an international quality horse should look like as a yearling, when discussing the ideal development of conformation and movement. Happily in 2015, Replikah’s legacy continued, and Dekadence earned her Gold Premium Mare status as a 3 year old and is now known as Verb. Pr. St. Dekadence. 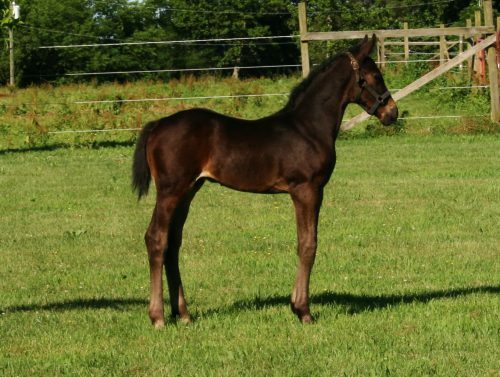 In 2015, Replikah produced her first Deutsches Reitpony filly by the RPSI pony stallion, Smoke Tree Snapdragon. 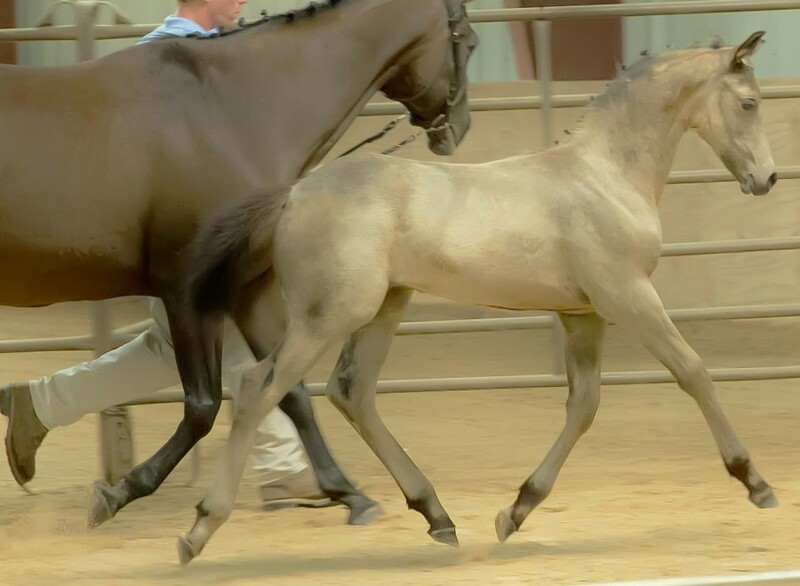 Thus arrived, Silke of Edenhof, the buckskin filly that looks and moves like the ultimate dressage horse, but in a smaller package. At her RPSI Inspection she caused quite a stir, wowwing both the judges and audience alike! Scoring an 8.6 on conformation and type, and then bettering that with a solid 9 for movement! Her overall score of 8.8 promoted her to Gold Premium status, Site Champion, and Highest Score German Riding Pony Filly of 2015! Silke was also the RPSI Stallion Service Auction Futurity winner of 2015! CHAMPION FOAL OVERALL in 2015! In 2016, at the age of 18, Replikah brought us a black colt by the FEI Stallion, Boleem. Again, she does not disappoint. Bravo! is a very typey colt who will mature to be both large and powerful. Extremely powerful quarters connect to an already well developing topline! Bravo! scored solid 8’s at his Inspection and was awarded Gold Premium. That makes 6 Gold Premium foals from Replikah!!! “Prince Rohan” was brought to us by Replikah in 2017 by our German Riding Pony Stallion, Evans Providence of the Night! The first chestnut she has produced has molted into the gorgeous and much coveted “liver” chestnut of dreams! He is absolutely stunning and scored a very impressive 8.5 for conformation demonstrating the amazing combination of both Providence and Regulus! Inspected with the Westfalen Registry who commented on his superb muscling and physique, another success with a bright future!